for two or two hundred. Congratulations! You have chosen your best friend to be your life partner. Together you will share your individual and common experiences with the one person you love more than any other. Teton Mountain Wedding was the first wedding planning company in Jackson Hole established in 1994. We know how important this day will be for you. We still do this because we love being part of your day. It is our honor. We believe IT IS ALL ABOUT YOU. We love to work with two of you for your small intimate wedding. We will take care of your needs. Planning a large destination wedding with family and friends—we have you covered. We pride ourselves for working within your budget. We will tell you about the costs you may incur. We do not accept commissions from any of our vendors. We know the Jackson Hole community, we know who is reliable and we select the best vendors that fit your needs. I can officiate/perform your ceremony whether we plan it or not. I will work with you to customize your ceremony. I want the ceremony to reflect the two of you. I invite you to have others participate. A reading or music are options. Some couples like to have a close friend or relative participate in some way. I create either a spiritual ceremony based on your background or if you prefer something more general then I will create a beautiful civil ceremony. I send you samples in advance for you to edit and approve. I have performed more than 450 weddings in Jackson Hole over many years. If you have a special person you wish to perform your ceremony, I will assist them with any questions and details. I am a third generation Jackson Hole native. I grew up on a true western Dude and Cattle ranch. After high school graduation, I attended university and worked on my first career in four different states. Always the beauty of this valley and the Grand Teton mountains beckoned me to return. I grew up skiing and over the years have done some fly fishing, kayaking, hiking and enjoying time as a wanna be artist in my studio painting with friends. 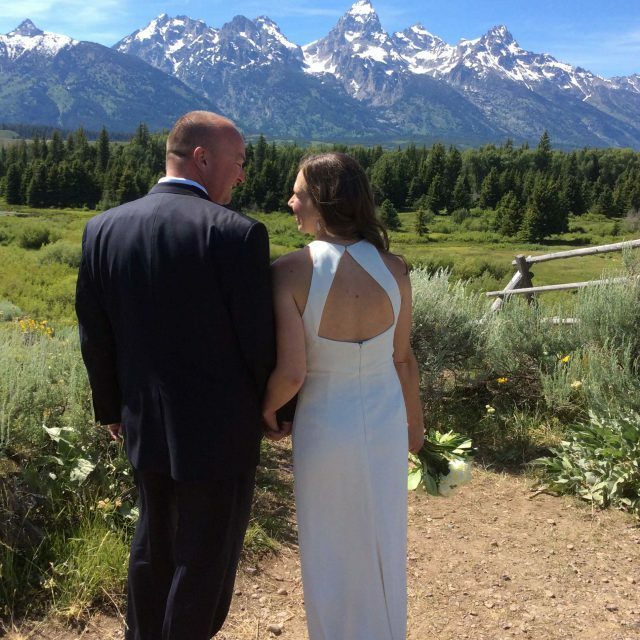 Whether simple and intimate or large and elaborate, Teton Mountain Weddings will help you find the perfect scenic location in Jackson Hole for your wedding ceremony and will assist you in creating your own personal vows. We will officiate at your wedding ceremony with a service designed especially for you. A romantic dinner for two at one of Jackson, Wyoming's fine restaurants or a grand reception at a spectacular lodge. From classical guitar to rock & roll, country western to jazz, Teton Mountain Weddings will arrange for live music or a DJ to add to the festivities of this special occasion. The Rocky Mountains of Wyoming are filled with wildflowers of every color. Imagine your wedding bouquet and floral arrangements created by one of Jackson's wonderful floral designers. Choose from long-stemmed wildflowers, hand-tied with satin ribbon, to bouquets of roses and centerpieces that will enhance your surroundings. Your wedding photographs will be like no others, set against the scenic backdrop of the Teton mountains. We can provide you with a professional photographer to create photographs you will treasure and enhance your memories for years to come. Choose from a variety of outdoor activities such as horseback riding, river rafting, skiing, snowmobiling, sleigh rides, and more. Combine your favorite activities with your wedding celebration or enjoy them during your honeymoon in Jackson Hole. Spend your wedding night and honeymoon in one of Jackson's beautiful lodges, with a cozy fireplace and even a Jacuzzi in your room. Teton Mountain Weddings will help you find the perfect place to enjoy intimate, relaxing evenings after full days of outdoor fun and adventure. Rehearsal dinners, meet & greets, along with salon and bakery recommendations. If you wish to make an advance visit we will take care of setting up appointments. We wanted to do something for you other than to say thank you, so what better way to help your business than to sing your praises. We called our travel agent and raved about your unique service and told them to keep your name on hand for clients looking for a truly wonderful ceremony to look back on with fond memories as two people grow old together. Gene & I want to thank you again for everything you did to make our wedding day absolutely perfect. We just couldn't have wished for anything nicer. Thanks for everything. We'd like to thank you for doing such a great job with the wedding. Everything went exactly as we wanted it and it took a lot off of our minds knowing that you were there to take care of everything. Thank you for everything you did and your kindness. Bridget & I both feel like we have made a friend in Jackson. Everything went perfectly & we will treasure the memories. Just a quick note to thank you for all your help. Our wedding day was beautiful and unforgettable. We couldn't have done it without you. You must go to the Teton County Administration Building. What do I need to bring for my license? Only your driver's license is necessary. You must appear at the Teton County Administration Building—we will give you the details. The fee is $30.00 and an additional $5.00 may be paid for the County to mail you a certified copy of your license. YES - You will need two witnesses. If you are going to elope or celebrate a private ceremony, Teton Mountain Weddings will help you with the witnesses. Can you send me prices for your different wedding/honeymoon event packages? 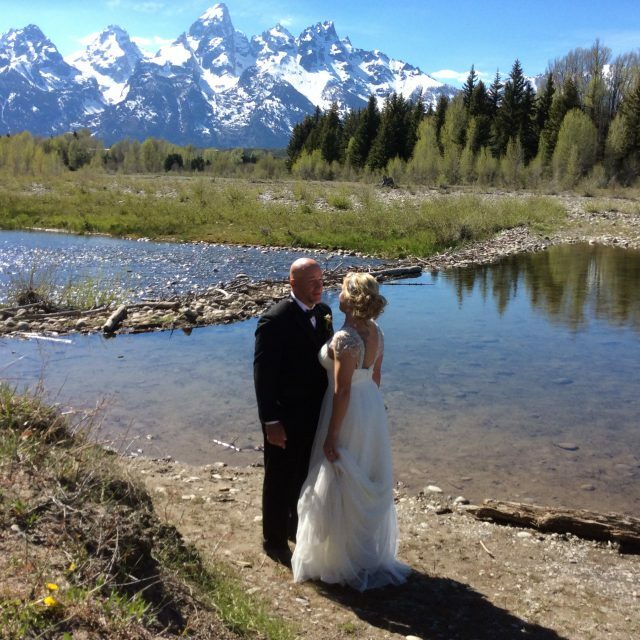 Teton Mountain Weddings plans every wedding personally to the wishes and needs of our clients. We do not offer packages because each wedding is different. We will work with you and your budget to provide you with the best services Jackson has to offer while staying within your budget requirements. How much do different services cost? Costs of services vary greatly depending on the type of service you want. Just as a starting point, here are some minimum costs for different services. Photographers - prices vary and we will recommend photographers who are dependable, skilled, and have knowledge of this area. Flowers - Hand Tied Bouquets are $75 and up Cake - Prices start at $50. Lodging - From approximately $150.00/night and up depending on the season. Activities - Range from $30.00 per person and up. Restaurants - From $25.00/person and up, plus tax, gratuity and alcohol.